Manure handling and application to agricultural land from animal facilities creates odor nuisances where population sprawl encroaches into once rural areas. 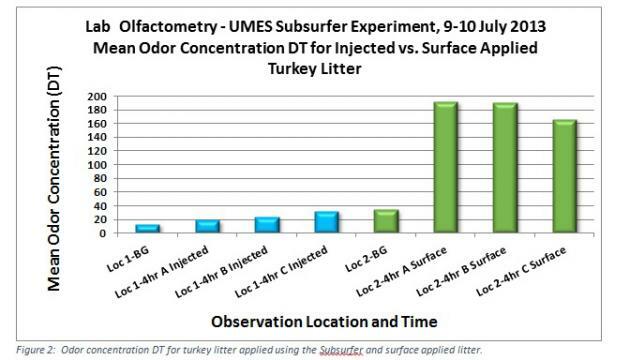 The University of Maryland Eastern Shores (UMES) and The Pennsylvania State University (PSU) collaborated on data collection to quantify the odor reduction benefit of a novel technology called the Subsurfer which places poultry litter of ≤ 25% moisture content beneath the soil surface as opposed to traditional broadcast application. Two 80-foot square locations were chosen at PSU’s Ag Progress site having similar grassy vegetation. For three separate trials, turkey litter was used, a slight departure from the usual use of poultry litter. This litter was chosen because it was available, and had a favorable moisture content of less than 25%. Three treatments were applied; subsurface application for location one , broadcasting for location two using the Subsurfer at the rate of two tons per acre, and no litter as a background. . Field-applied litter was evaluated using Nasal Ranger Field Olfactometer (NRO) instruments measuring dilutions-to-threshold (D/T) during field application employing the Multiple-Assessor Repeat Observation (MARO) method (Brandt et at., 2011a and 2011b). Odor assessment teams made observations at each location prior to litter application (background measurement) and at 1, 4, and 24 hr after the litter was applied at each location. Whole air samples were collected in 10-liter Tedlar® bags 4 hr after litter application using surface isolation flux chambers and the vacuum suitcases. 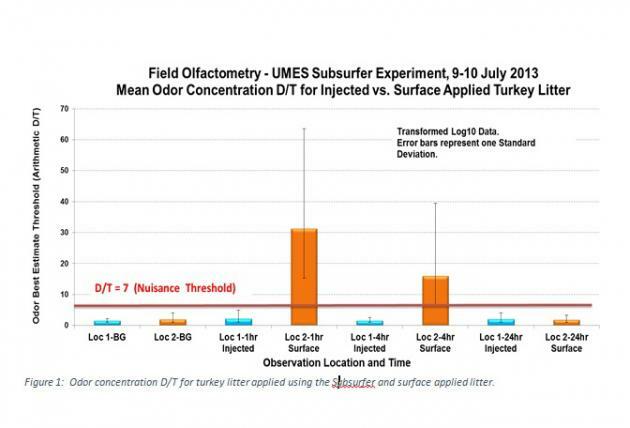 A team of five qualified odor panelists quantified odor detection threshold (DT) using Dynamic Triangular Forced-Choice Olfactometry (DTFCO) on an Ac’ScentTM International Dynamic Olfactometer (St. Croix Sensory, Lake Elmo, MN) the same day of sample collection. Results show greater than 75% reduction in mean odor concentration by DTFCO and NRO-MARO methods when the Subsurfer is used. Figure 1 shows the odor concentration D/T reduction of 92% (97% less background) for the 9 July 2013 data collection event when applying litter using the Subsurfer. Results from subsequent events (23 and 25 July 2013) showed significant reduction as well not below 75% when litter was applied using the Subsurfer. Figure 2 exhibits the same trend of 86% reduction (92% less background) in odor concentration DT using the DTFCO method. Again, measurements from subsequent data collection events yield similar results (minimum 75% reduction of odor concentration when the Subsurfer is used). No future work is planned at this time. Brandt, R.C., H.A. Elliott, M.A.A. Adviento-Borbe, E.F. Wheeler, P.J.A. Kleinman, and D.B. Beegle. 2011a. Field Olfactometry Assessment of Dairy Manure Land Application Methods. J. Environ. Qual. 40: 431-437.